Like many electronic dance music fans, we’re eagerly anticipating that one week in October when Amsterdam is home to some of the most exciting events, conferences, meetings and happenings in the world. Solarstone is proud to represent the ever-growing and beloved Pure Trance movement by hosting yet another ADE special. For the 7th year in a row, you’ll find his Pure Trance night high on the ADE agenda. On October 20th, in collaboration with Quest4Trance, Pure Trance ADE 2018 lands at the KBF Complex, close to downtown Amsterdam. In addition to all things Pure, we will be celebrating Solarstone’s very own birthday! Hosted by Solarstone, you’re welcome to join us for an all-nighter that’s all about the unmistakable emotion, connection and feel-good atmosphere of Pure Trance, with an outstanding ADE exclusive line-up of international trance names, extended sets, & live performances. 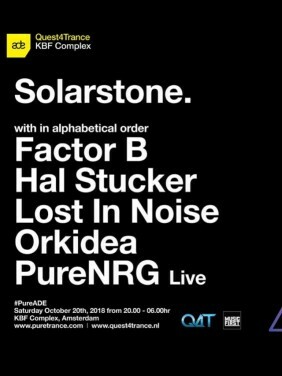 Joining Solarstone behind the decks on October 20th at the KBF Complex in Amsterdam, are Factor B, Hal Stucker, Lost in Noise (Indecent Noise vs Lostly), DJ Orkidea and, in collaboration with Giuseppe Ottaviani, a special live performance by Pure NRG (live)! This’ll be one night to remember. * we've adressed all issues raised by guests last year and made some changes to the organization - there'll be more toilets, more token stands and extra bars. DURING VISITING The KBF Complex and the Pure Trance ADE 2018 event, VISITORS ARE SUBJECT TO THE FOLLOWING HOUSE RULES. 1. Visitors of Pure Trance ADE 2018 enter the event at their own risk. Quest4Trance takes no responsibility for any damages or harm to visitors and/or their possessions. 2. It’s prohibited to own, use or deal drugs at the location. Upon violation, police will be called in. 3. Visitors are held to follow instructions, regulations and/or directions of security staff and/or police at Pure Trance ADE 2018 at all times. If not, visitors will be removed from the KBF Complex. 4. To protect all visitors, you may be searched. If you refuse to accept, access to the event might be refused. 5. The organization reserves the right to refuse / deny (further) access to visitors in a drunken state and/or under the influence of narcotics. Upon violation, the police may be notified. 6. Access won’t be granted to persons in possession of fire arms or other dangerous or prohibited items. If these are found, police will be called in. 7. It’s not allowed to bring your own drink or food to the Pure Trance ADE 2018 event. 8. At the Pure Trance ADE 2018 event, all daily, socials standards and values apply. In case of misdemeanor, you will be removed from site and notified to the police. 9. At the event, it’s possible that more than 85 (DB (a) of sound will be produced. The organization doesn’t take responsibility for any hearing damage and advises the use of earplugs. 10. It is not allowed to engage in commercial activities on the site without the permission of the organization. Commercial activities include spreading flyers and hanging posters. 11. Wearing a football shirt and/or discriminatory clothing is not allowed; access will be denied. 12. The organization reserves the right at any time to adjust the program, date and time without the requirement of a refund. 13. During the event, photographs and video recordings will be made for promotional purposes. Upon entering the KBF Complex, you agree to this. 14. In case access to the event has been denied to visitors, they lose the right to reimbursement of tickets, any service charges and/or other costs. 15. On the event terrain, in the provisions these house rules don’t apply, Dutch legislation applies. 16. Backpacks are prohibited. Lockers are available to store these. 17. Smoking is permitted only at the designated spot. If you do not adhere to this rule, you will be removed from the location. 18. Quest4Trance takes no responsibility for any loss or damages to the possessions of visitors. 19. It is prohibited to bring professional photo and / or movie equipment without the permission of the organization.